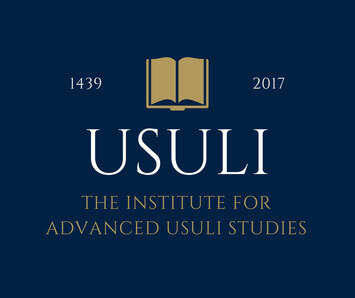 The Usuli Institute is proud to present its educational events via livestream when possible, and recorded for viewing online on our YouTube channel or as listed below. Our regular Halaqa (Circle of Learning) sessions cover both pressing issues confronting humanity today, as well as deeper investigations into the Islamic Intellectual tradition such as Original Qur'anic Commentaries (Tafsir) and the Meaning, Purpose and Effect of Prayer. In our Usuli Institute Conversation Series, we bring guests to discuss specific issues or hot topics. Our Friday Virtual Jumu'a and Khutbahs offer weekly spiritual and intellectual inspiration and uplift for living as thinking, ethical and engaged Muslims confronting modern-day challenges. Be sure to follow us on Facebook for the most up-to-date notifications of events and new uploads. Grace Song is the Executive Director of the Usuli Institute, and regularly shares her personal stories, reflections and ideas in the introduction to each halaqa, presented here. She brings a unique voice to the Usuli Institute as a woman, an American-born-and-raised daughter of Taiwanese immigrants, a Muslim convert since 1994, before she knew Dr. Abou El Fadl, and ultimately as the wife and partner to such a learned Muslim scholar. Her introductions seek to illuminate the importance of knowledge and the impact of the Usuli approach to everyday life as a Muslim in America - engaged in modern day challenges with a commitment to moral and ethical beauty and reasonableness in all affairs, while seeking the divine path. In the introduction to the Usuli Institute halaqa on Surah 100: Al 'Adiyat, Director Grace Song discusses the powerful net take-away from Dr. Khaled Abou El Fadl's Friday virtual khutbah (15 February 2019), in which he argues that Muslims in the West can and must start anew in defining their faith, casting away the hypocritical and despotic messages of Islam coming from Middle Eastern lands, and instead, relying on the God-given religion of fitrah (natural instinct, intuitiveness and innateness) where the justice, beauty and reasonableness inherent to each human being is their guide. She encourages everyone to watch and share this transformative khutbah, which gives Muslims back their faith, releasing them from all of the ugly, oppressive and backwards messages that make people turn away from Islam. Muslims in the West have now been given permission and license to redefine what it means to be a thinking, ethical and moral Muslim in our day and age. Lastly, she pays honor and tribute to Guido Santi, a dear friend and documentary filmmaker, by telling the story of Guido, his importance in the history of the Usuli Institute, and the impact of his living example as a beautiful, moral and ethical human being. Delivered 16 February 2019.